ButterflyVPN is a little different from most VPN services and, if executed right, has the potential to be a game-changer. It is a travel-friendly VPN router you can take with you on the go and hook up to your devices for protection anywhere there’s a Wi-Fi connection. Before we find out whether it’s really worth all the hype, we would just like to clarify something—ButterflyVPN is not a true VPN. It is more of a two-way encrypted proxy. Keeping that in mind, here’s how to use ButterflyVPN. The VPN itself is contained within a USB device that you then plug into a power source such as a USB drive connected to a power source. Once you’ve done this, you simply connect through an existing Wi-Fi signal and you’re ready to go. 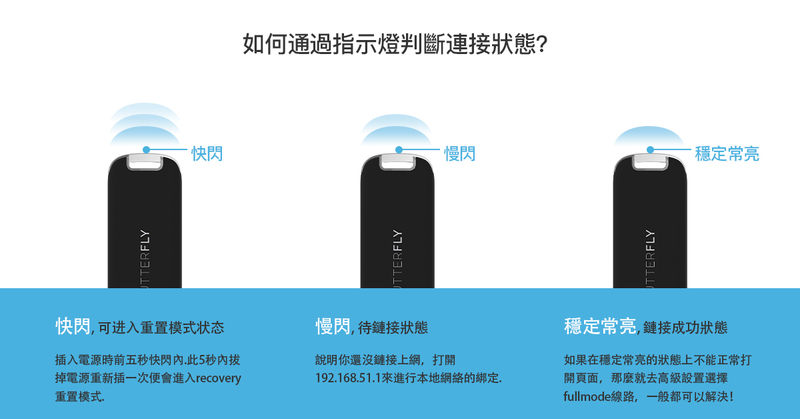 It’s a plug-in-and-play VPN that is designed for travelers who want reliable protection when using public networks. Full mode: This gives you access to a regular VPN service that is (supposedly) secure, encrypted, and stands up to day-to-day tasks. Intelligent mode: ButterflyVPN chooses the best line based on the website you are visiting. For example, if you are in China and visit YouTube, it should choose a line in Europe or the U.S.
Tor mode: All your traffic goes through the Tor Network. This raises a few questions. First, why market your product as a travel-friendly VPN router designed for use on public networks and then suggest that it can be used with devices such as games consoles? While we accept that it may be compatible with any Wi-Fi-enabled device and that you can connect 10 simultaneous devices, ButterflyVPN, never mind a public network, is never going to be powerful enough to handle 10 devices over their 1000M lines. If you’re looking for an actual powerful VPN router, there are plenty of options out there. 14 days is a pretty standard money-back guarantee. We’re not sure if you have to send their hardware back within that timeframe, though—the website doesn’t provide any information about it. ButterflyVPN accepts credit cards, debit cards, pre-paid cards, and PayPal as payment methods. It’s great that they accept pre-paid cards but they still don’t offer other anonymous options like Bitcoin. A tutorial on how to set up and connect ButterflyVPN is available on their website. A lot of their images are in Chinese, though. It’s a strange choice–do they have a lot of Chinese customers? It’s because it’s a Chinese company and yes, they’re aiming to take on the Chinese market. There’s also a list of FAQs you can browse through to find answers to some basic questions. Beyond that, there’s a blog with one article on it. We’re not sure if they plan to add more content to it or not, but the one and only post was made in October 2018. ButterflyVPN users get a choice of the U.S., Europe, Singapore, Japan, and China–the options are quite limited. With 30 servers spread across 5 locations, ButterflyVPN isn’t going to be winning any awards for offering the most expansive service. However, it is always a case of quality over quantity. It’s much better to have a small handful of good, robust, and fast servers than a huge selection of average, slow servers that make the VPN difficult to use. 500 lines, 1000M bandwidth, and >50ms delay. These are respectable numbers but it all comes down to how fast the public network you are connected to is. If it is very slow, your VPN’s overall speed will be reduced. If it is fast, however, you can take advantage of the 1000M bandwidth lines that ButterflyVPN offers. It doesn’t quite seem to be this way, though. Because it is a proxy that is bouncing your traffic all over the place, it is going to be (naturally) very slow. Our speed tests showed download speeds at 4.50Mbps. This is generally the speeds we get when we connect to a Chinese server. It’s is primitive and definitely not fast. It’s even slower on Tor mode as you would imagine. ButterflyVPN does not work with Netflix. 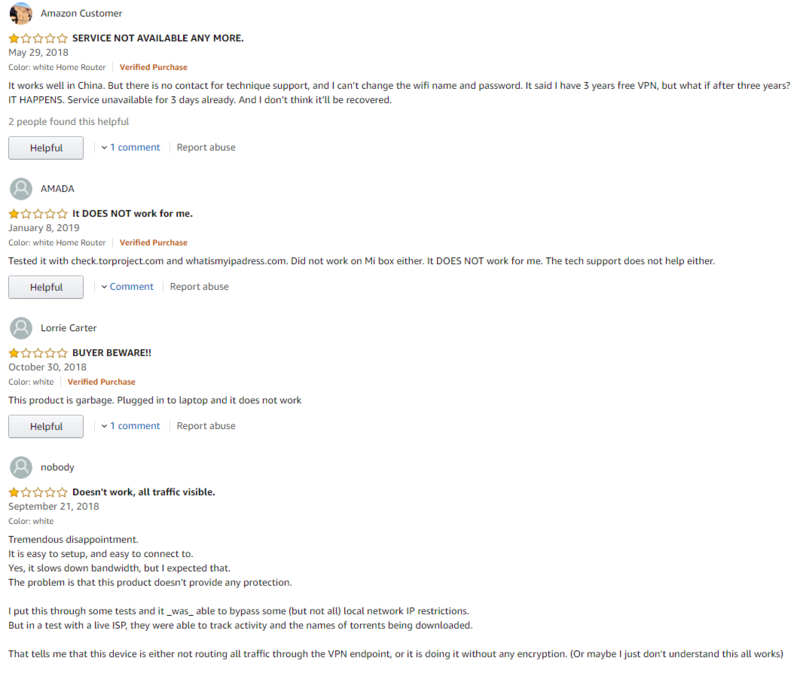 In fact, the manufacturers themselves state on their Amazon page that the ButterflyVPN USB is not intended for use with Netflix, Hulu, Amazon Prime, or Fire Stick, etc. To unblock streaming sites, you’ll need to use the best VPNs for Netflix. We could not find much information regarding whether torrenting is supported through ButterflyVPN. Their website, Indiegogo, and Amazon pages do not provide any proper information. So, no—torrenting isn’t allowed. But we won’t leave you stranded. Here are the best VPNs for torrenting. For $99 you get ButterflyVPN’s router, USB stick, and a 3-year subscription to their service. You also get one year’s hardware maintenance so if your USB or router break, you should, theoretically, get it replaced without additional cost. At this stage, we cannot comment on this policy as ButterflyVPN is a very new service. As you can see, their Amazon description does not clarify whether you are just getting the hardware for $29 or if this also includes a subscription. ButterflyVPN provides an email address for its customers. It does not offer live chat support at this time. The customer service seems pretty minimal. The only information that ButterflyVPN’s website and Indiegogo page provides regarding encryption and protocols used is… well, nothing. We cannot take their word for it—we need proof. Also, if anybody can tell us what “Which is hard to be recognized than IPsec and L2TP, more stable than an app” means, please let us know. ButterflyVPN does not include a kill switch. This means that if you are connected to their service and your connection suddenly drops or is disrupted, everything you are doing will be compromised by becoming visible. On a public network, this is the last thing you want. A kill switch is a must-have and, unfortunately, ButterflyVPN’s creators do not understand this. We are not sure what company is behind ButterflyVPN or what their history is. There is virtually no information available online—ButterflyVPN itself is very new. Unsurprisingly, their website doesn’t provide any information about where ButterflyVPN’s parent company is headquartered. On Indiegogo, though, we can see that they are based in California. This means that they fall within the 14 Eyes agreement that facilitates the sharing of intelligence and information between major world-leading countries. First, what’s the point of using a VPN through a dongle and portable router setup? It’s not even a proper VPN, it’s a proxy! If you want a travel-friendly VPN, subscribe to ExpressVPN, NordVPN, or any VPN on our list of top 10 VPN services. In fact, how are physical devices like a USB and router travel-friendly? It’s extra stuff for you to pack! With a decent VPN–something that can be bought at around the same price point as ButterflyVPN–you can install their native apps on all your devices and get covered by a fast, robust, expansive, and secure VPN service wherever you go. You just don’t need to mess about with a ridiculous USB and portable router. Do we recommend ButterflyVPN? Absolutely not. If you are in the market for a VPN service, spend your money on one that is proven and reliable. Our best VPN recommendations are right around the corner.